When I reviewed the incredible Logsdon Seizoen Bretta, I solicited recommendations for other brett saisons. Reader Jeff suggested Lost Abbey Carnevale (bottle dutifully acquired and queued for review) and Anchorage Love Buzz. Unfortunately, the latter hasn't yet appeared on our shores down here in San Diego. 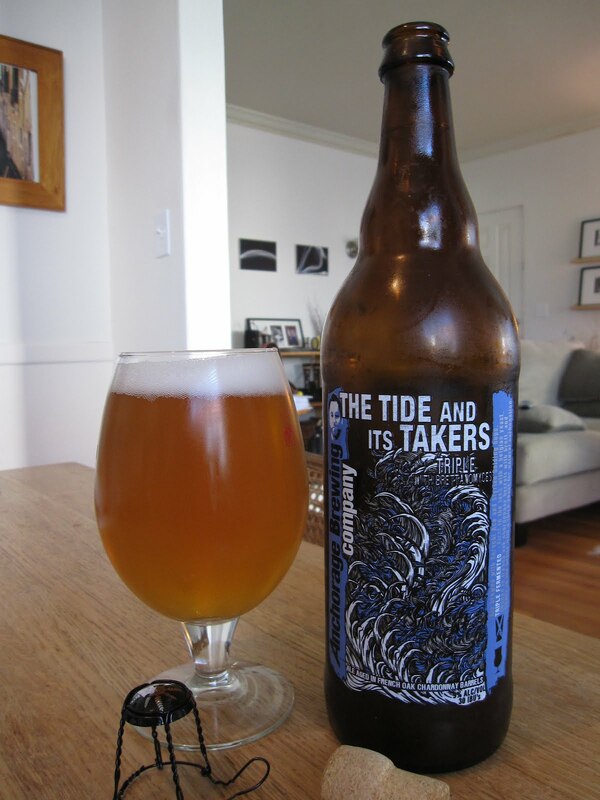 However, two other non-saison Anchorage brews have, and this is one of them. 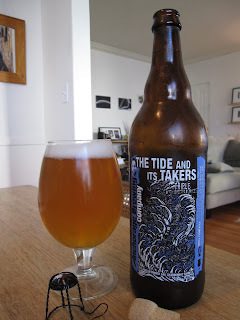 Anchorage is a new brewery (less than a year old) that's already taking on some challenging styles (saison, tripel, IPA among them) and adding an extra degree of difficulty by barrel fermenting all of them with brettanomyces. Kudos for effort. However, all that effort comes at a steep price- this is easily the most expensive beer I've reviewed. The name for this one is kind of interesting. Apparently it's titled after an album by Anchorage metalcore band 36 Crazyfists, about whom I know nothing because I'm not a metalcore aficionado. I'm not sure what the name is supposed to mean in either case. Maybe it's a tribute to the participants of the huge laundry detergent theft crime wave sweeping the country. On to the beer. If I hadn't been gripping the cork tightly, it would've hit the ceiling. It's got the nice cloudy yellow/orange color you'd expect from a tripel. The brett is the primary thing I get on the nose- it brings a strong orange/lemon scent. I only get a faint sense of regular tripel aromas because of the funky tartness coming from the brett- they're there, but it takes some study. There's also something floral/vegetal in there, but I can't quite identify it. Well, as I sort of expected, this is kind of a mindfuck, but in a good way. There's so many different flavors swimming around in there that it's difficult to disentangle them, and I'm really only trying to do so because I'm reviewing it. The brett funk is the first thing I taste. The barrels used for fermenting this were french oak chardonnay casks, and both the wine and the oak come in next. The finish is tripel through and through, with wheaty sourness and funk, plus a little alcoholic sharpness. The citrusy sourness from the brett pervades everything...of course, if it didn't, what would be the point? The primary reason I like this is because it's a palate-challenger. My tastebuds don't know what the hell's going on in there. From a straight beer-drankin' perspective I like it again and it's got great flavor, but there's something there that I find a touch off-putting. As I make my way through the glass, I keep getting something vaguely chemical. Maybe it's just the combination of the lemony funk from the brett and the alcohol tinge on the finish. I'm not saying it tastes like Lemon Pledge or anything, it's just something a little odd. In the end, I don't at all mind having paid a premium for this because it stretches my beer knowledge. Since that's the whole point of writing for this blog in the first place (i.e. becoming a borderline alcoholic but justifying it in the name of education), I'm on board, and I'll be going after the Galaxy IPA next.